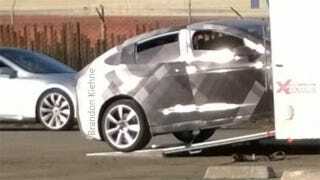 This might be the first sighting of the Tesla Model 3, the automaker's $35,000 mass-market electric vehicle. Or it could be a strange shot of a Model X prototype. Or a mirage. We're not sure. The photo was supposedly snapped at the shuttered Alameda Naval Air Station, about 30 miles north of Tesla's factory in Fremont, CA, and that claim looks legit based on the cargo ship in the background. What isn't clear is the scale of the prototype. Our tipster Erik thought it was the Model X, but based on the size of the Model S in the background, the camo'd prototype looks small, leading the photographer to believe it's the Model 3.